I recently joined the Netherlands-America Foundation (NAF) in Boston. 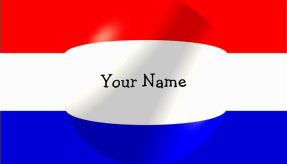 The NAF is a charitable membership organization that promotes business, cultural, and educational relations among members of the Dutch community and people of Dutch descent in New England, and fosters business relations between the United States and the Netherlands. If you’ve been reading this blog for a while, you know that I’ve been writing about my immigration experience in the past. Thanks to those posts, I received an email from a Belgian expat partner about a year ago. He just arrived in Boston and wanted to chat over a coffee. Now, a year later, he and his wife became good friends of us and we hang out with them regularly during the weekends. It made me wonder: why isn’t there a place where expat partners can meet up ? And that’s how the idea for an expat partners event was born. So, did you move to Boston for or with your partner? Feel free to join us on Tuesday, June 5th from 7.30 pm at Daedalus in Cambridge to exchange thoughts, tips and tricks and get to know each other. During the event you can ask questions to an immigration attorney, an independent contractor, an experienced volunteer, a personal coach or an HR Director from Philips. There is also an opportunity to get feedback on your resume. The way Boston welcomes entrepreneurs and start-ups keeps surprising me. And I thought Amsterdam was a hub…. Here in Boston, a wide variety of organizations provide office space, advice and create environments for them to thrive faster. Some are initiated by the city of Boston, others are 100% private. 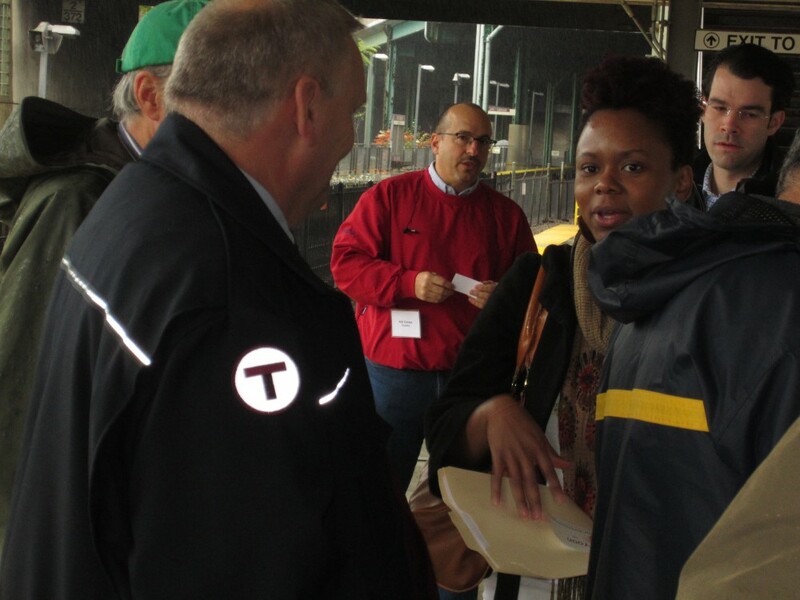 On Thursday, the 27th of October, I joined the Innovation Express on behalf of BostonTweetUp. This networking event was an initiative of Boston World Partnership (BWP), an organization that I was introduced to a few months earlier at the Leaders Networking Reception. The Innovation Express aimed at bringing incubators and entrepreneurs together. On the Red Line of the T this time.. starting at JFK/UMass, all the way to Davis and back to Kendall Square. Honestly, I wasn’t quite sure how this was going to work out. Were we supposed to walk over to each location to learn about their services and facilities? Or were we going to stay on the train? If so, how were other participants who boarded along the Red Line able to find us? Entrepreneurs who I talked to had exactly the same questions, but admitted that this was also one of the reasons why they signed up for the Innovation Express. Just out of curiosity next to the networking opportunity. Yoon J. Lee and Paola Mesadieu from BWP did a great job in communicating the details about the Innovation Express. Everybody who wanted to jump on along the Red line, was welcome to join the Innovation Express in the last car of the train. 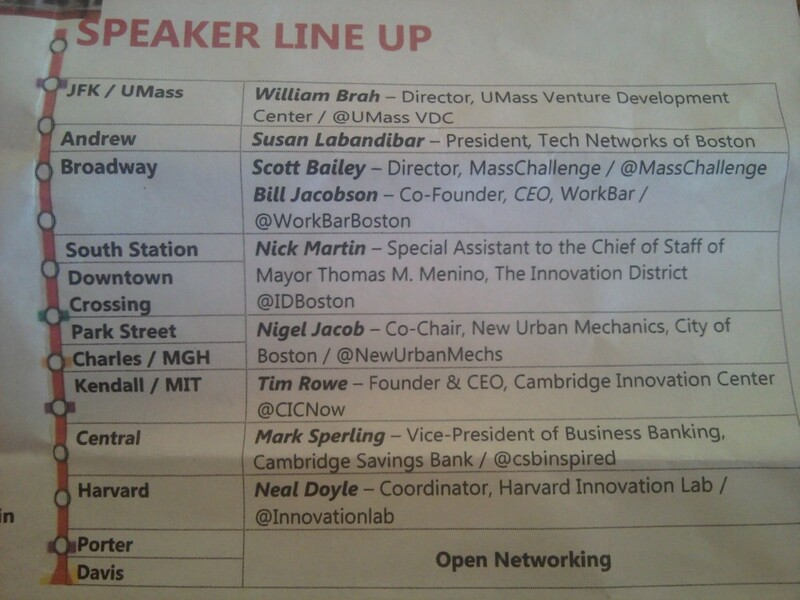 “The Red Line is a key component in what makes the Innovation District work. It connects important innovative hubs in the city and serves as the artery that brings Boston’s best talent together,” as explained by Boston Mayor Thomas M. Menino, who started Boston World Partnership in order to raise global awareness of Boston as one of the world’s foremost centers of intellectual capital and innovation. About eight speakers, using a bullhorn, explained their services and facilities to the entrepreneurs who joined the Express. 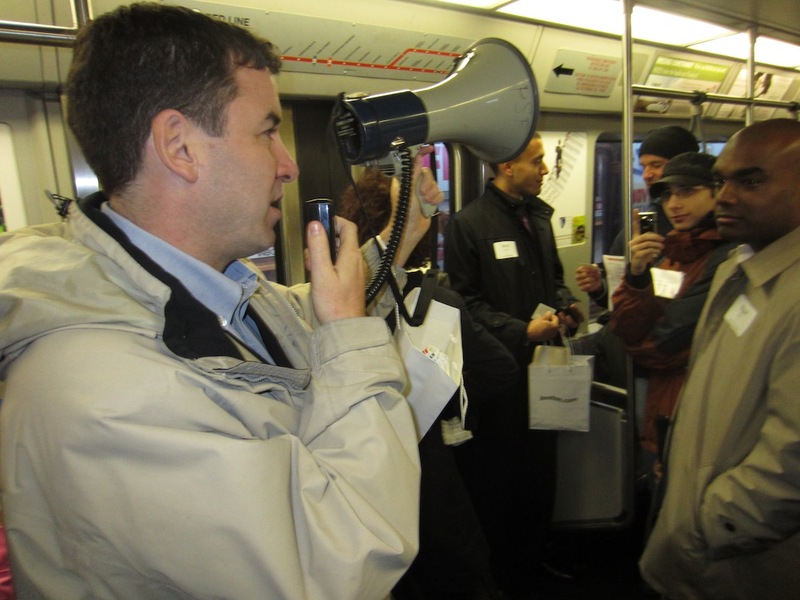 Sometimes interrupted by the MBTA personal, making announcements on the loudspeaker as well, but overall they reached their audience quite well. Because of the awkward location – passengers who didn’t have anything to do with the Innovation Express entered the car as well – the atmosphere during the event became informative, but informal and fun almost immediately. Back at Kendall Square, everybody gathered on the 4th Floor of the Cambridge Innovation Center (CIC), where the Venture Café – held every Thursday from 3 pm – was just about to start. A smart way to integrate these two events into one. Especially because Cambridge Innovation Center, located in the middle of the MIT campus, is one of the most popular flexible office facilities for technology and life science start-ups in Boston. Or Cambridge, I should say. I’ve been to the Venture Café before and met all different kind of people there. Lawyers, venture capitalists, students, self-employed designers, coaches and marketeers. The mix of these people all together makes every visit a surprise and worth going. Nobody is left alone standing in a corner, which happens occasionally when you visit a networking event in the Netherlands – yes even in Amsterdam. Not in Boston. Everybody got a story to tell, that’s the common attitude in Boston. This openness creates new ideas and possibilities as well. People get to connect and build new professional relationships with each other. An atmosphere which is in my opinion as important – and an equal contributor to the hub – as its facilitators and incubators for start-ups. Guess what I did, when Joselin was looking for help. I applied immediately. After my first meeting with Joselin, I felt energized. His mind is always full of ideas; he knows how to – and how not to! – organize a Tweetup; he has energy for 3 and is always willing to hear your opinion. In short, I really wanted to work with this inspiring guy. So since a few months, I also blog about the events in and around Boston for BostonTweetup.com. For example, I covered the What not to web event organized by the MIT Forum, the Boston World Partnership Leaders Networking Reception and a Boston PHP Meetup. During those events, I noticed almost everybody knows BostonTweetup. Either from the MegaTweetup Joselin organized, the online event calendar or its Twitter feed. But next to promoting events and organizing a yearly record-breaking Tweetup, we also help organizers with their event planning and – maybe even more important – the way they can leverage social media before, during and after the event. At the moment, we’re busy relaunching the website. The site got a new lay-out and includes episodes from BostonTweetup TV, event planning guides, reviews of events, networking tips plus information for venues, sponsors and others. A lot of this is already live, some we still need to work on. In the meanwhile, check it out yourself on BostonTweetup.com or watch this video interview that was taken with Joselin during the Inbound Marketing Summit with the Pulse Network. On the 20th and the 21st of July Bill Boorman (@BillBoorman) organized TRU Boston (The Real Unconference) which was held at Bullhorn, a software agency for staffing and recruiting. Those of you who’ve been to TRU in Amsterdam before, probably remember Bill and his stunning appearance. 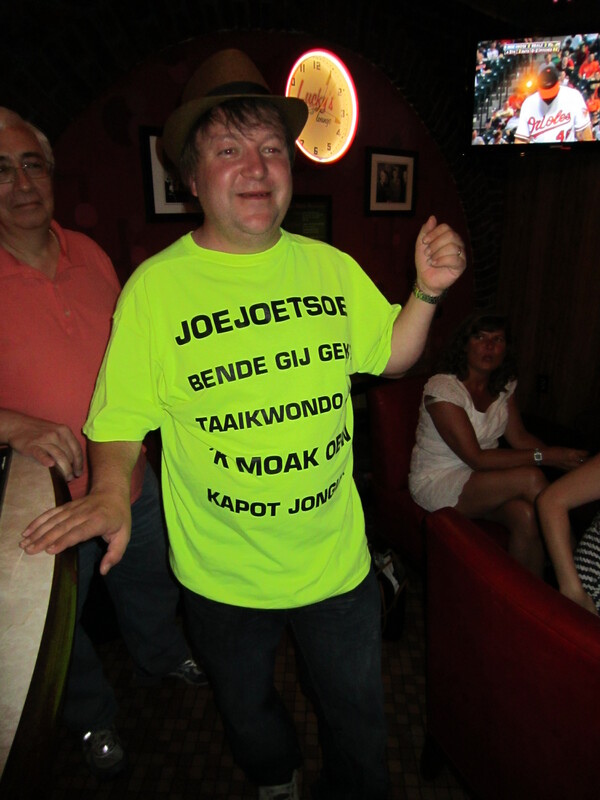 Well, he still looks good, in a yellow T-shirt with Dutch slang on it. Back to the content. Because that’s what it’s all about. Whether in employer branding, on your blog or in a resume. As for work life balance goes, I realized a 4 day workweek isn’t as common in the US as in the Netherlands. First of all, simply because the Labor Code requirements eliminate most employers and employees from choosing schedule options such as part-time and compressed workweeks. Plus, most corporate companies still think physical presence of their employees is the only guarantee that they are working. Start-ups seem to be the exception here. Since many of them start with a virtual office, they even require new hires to know how to manage or work in this kind of environment. While recruiters usually spend a lot of money on the services LinkedIn provides, there are also a few tools that aren’t that well known, which are free to use. Like LinkedIn Signals which makes it possible to search through updates from users, on keywords like unemployed. A great example on how to engage with your candidates is the way Deloitte in New Zealand used their Facebook page. On a livestream young professionals where telling their Facebook fans how their life has changed after they graduated and how they experience their first job, at Deloitte of course. These ambassadors also met up with graduates during campus recruitment activities. No, not on the traditional job fairs, but on a BBQ on campus! Engaging with these candidates through social media, seems to be more effective than spending the budget on traditional recruitment advertising. UPS only spends 3% of their recruitment media budget on print, according to Mike Vangel. More about the UPS case and the importance of tracking social media in this video. However engaging with candidates through social media still needs a lot of time and effort. Not only from social recruiters or employer brand managers, the management needs to trust their employees as well. Your recruiters hired these people, right? That means they understand the concept of appropriateness, whether it is in the elevator at the watercooler or on Facebook. Don’t confront them with the rules and regulations that state they’re not allowed to say anything on the company’s behalf. They are grown-ups who can take their responsibilities and use common sense. Trust them. A social media policy therefore should not be longer than one sentence stating something like: don’t burn bridges or don’t put anything out there that you don’t want your mother to see. Once the managements fear is turned into trust, don’t think that those employees who were enthousiastic from the start will become active bloggers, and use Twitter and Facebook and engage with potential candidates immediately. Many of us have experienced that they also needed reinsurance after the kick-off meeting that they are not going to be fired for writing a blogpost.. .. These were just a few topics that we discussed on TRU Boston. In short, it was an inspiring event for everybody in the recruitment, HR or employer branding business. 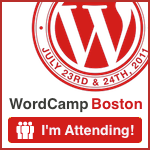 It made me wonder, why isn’t there a meetup group yet for professionals who work in these industries in and around Boston? Well…. the idea of starting such a group also came up, so in the near future @leanneclc and I might start one. What do you think, are you in? Let us know! Mastering programs like Excel, Powerpoint or languages ​​like Java or PHP, are easily added to a resume. Skills that are crucial anchor points for recruiters. But how to validate these skills? During an interview a recruiter might be able to find out more about to what extent a job seeker is familiar with Google Analytics or the use of Twitter for example. But since these online tools are developing and changing rapidly, there is a need to validate these skills. Smarterer, a start-up from Boston, has come up with a solution. Whether it’s for Matlab, Final Cut Pro or Outlook, all questions are created by users themselves – crowdsourced – and approved by the team of Smarterer. CEO Jennifer Fremont-Smith told me that everyone is free to add a test. Multinational corporations, small businesses and software developers, whether they speak French or Spanish. “Just make sure you mention the language in the title”, Fremont-Smith said. Every test needs a minimum of 20 questions. However, Smarterer is making an effort at this moment to approach experts to come up with questions as well whenever the creator could think of a few questions but not up till 20. According to Fremont-Smith, ‘pending’ tests do need to be interesting enough for a large audience in order for Smarterer to proactively search for more input. 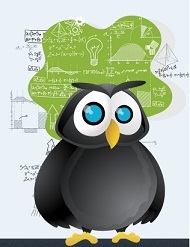 After the minimum of 20 questions, applicants who want to obtain a higher score can add questions themselves as well. Users who do, are rewarded with a higher score. After 10 questions you will get a score between 1 and 800. You can either choose to continue and improve your score or stop at that point. You might even want to publish a badge on your LinkedIn profile or another (digital) resume to show off! So with only one click the recruiter will see right away what your level is with a certain program compared to other (so-called) specialists. Currently Smarterer is still in beta. In June 2011 the company received an investment of $ 1,250,000 of True Ventures and Goolge Ventures. Do you have an idea for a test or just want to see how smart you are? Click on the badge for an invite. A few months ago, I interviewed Katja Berkhout, Area Director of Boston for the Netherlands Foreign Investment Agency (NFIA). We talked for almost two hours. About her decision to move to Boston with her husband and daughter, cultural differences, her objectives as an Area Director and lots of other things. But what really impressed me, were the examples she gave me of companies from Massachusetts that decided to establish an office in the Netherlands and use it as a gateway to Europe. Katja’s main goal is to help companies from New England and eastern Canada establish their European operations in the Netherlands. She provides them with the necessary information and connects them to valuable networks and institutions in Holland. Through benchmarking and case studies, her team brings the benefits of a location in the Netherlands to light. For example, the Canadian company Bombardier Aerospace estabilished its European service center at Schiphol, because of its central location in relation to customers. And Vistaprint chose for an office in the south of Holland, near the Belgium and German border, due to the quality of the distribution infrastructure of that area and the competitive tax rates in our country. For the life science industry, the quality and availability of skilled employees in our country can be decisive. At least, for the MA-based biotech giant Genzyme it was. Today the interview with Katja Berkhout was published on one of the mayor career sites in the Netherlands, intermediair.nl (in Dutch). A few weeks ago a campaign for the Dutch Railways (NS) which I managed for Co Unlimited received an advertising award: a SAN Accent. It's still premature to scream out loud that we're well prepared for winter #wintermaatregelen #NS, but up til now I'm kind of proud! Usually I blog about Boston, PR or HR communication. Some of my posts are in Dutch, some in English, depending on the topic. Back in Amsterdam I used to give social media and free publicity workshops. Although most of my time I spent on writing all sorts of copy. From press releases to blogs and editorials, online and offline.